What is now known as Sally’s Diner was not always named that. The diner was originally built in 1957 by the Mountain View Diner’s Company. Sally’s diner is number 522 of 523 diners built by the company. The diner had two previous names before it arrived in Erie, Pennsylvania. It was originally called Serro’s Diner, located in Norwin, Pennsylvania. After that, the diner was moved to Butler, Pennsylvania in 1976 where it was named Morgan’s Eastland Diner. 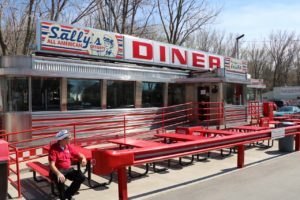 In 2003, Sean Candela purchased the diner and named it Sally’s, his mother’s nickname. Bringing the diner to Erie, was such a massive undertaking that the diner was brought in two pieces. Visitors to Sally’s can still see the line that separated each piece. Another unique feature to the diner is the original booths, tables, tiles, and counter top. The diner has served many purposes throughout its 14 years at Sara’s; In recent years, we have been finding more and more ways to utilize the diner. Today the diner is a one stop shop for Sara’s memorabilia; it is also used as extra, air-conditioned, seating for our patrons, and overall, a special step back into the past.